We’ve been quiet on the blog front for a while, but a lot has been happening on the personal front. The biggest change for me has been with work: as of September, I am no longer spending half my life in Asia — and my carbon footprint has shot down to human proportions. Meanwhile, thanks in part to our ratty neighbours and compost challenges, Bonnie Lee has gone on a quest to create a local composting solution for multifamily dwellings, which has led to two things: she is working with LA Compost to bring a solution to Palms, and has become a member of the Palms Neighborhood Council Green Committee. We’re also both members of the Technology Innovation Council which the USDA asked the folks at Food Cowboy to set up. With all that going on, maybe we can be excused for having allowed two lemons to start looking a little dry — two lemons for which we had no immediate plans. 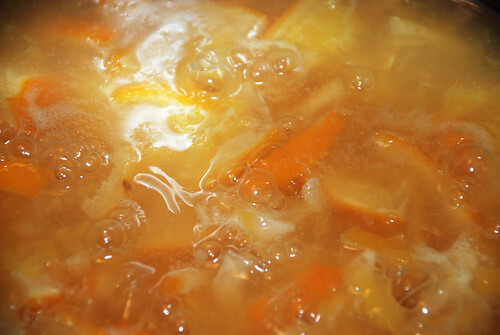 We also had a big, sweet navel orange sitting around, so decided to try our hand at marmalade. 2. Cover with water, and boil for five minutes. 4. Remove wedges from liquid (and leave the liquid in the pot — you will need it). 5. Cut each wedge crosswise into thin slices, and return to the pot. 6. Boil for one hour. 7. 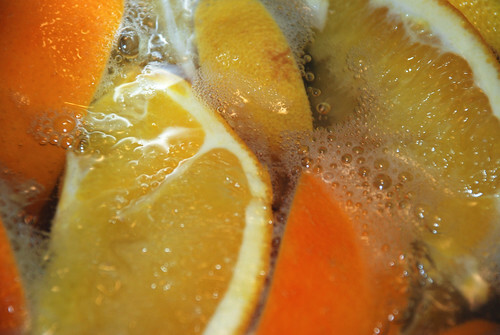 Add sugar to boiled fruit mixture. Basically, you should be adding the same volume of sugar as you have fruit mixture, but we used a little less. We had 3 cups of mixture at this point, and used 2.5 cups sugar. 8. Continue to boil, occasionally spooning some of the mixture onto a plate, letting it cool to room temperature, and running a spoon through it. When you get something with the consistency shown in the picture above, you’re done. 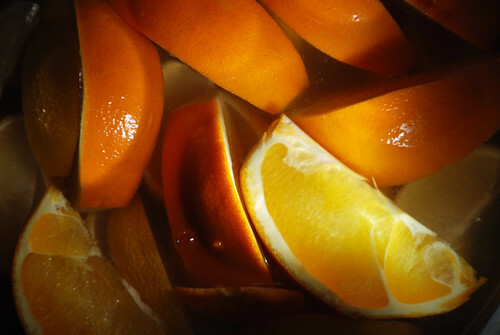 This entry was posted in On food waste, Taking action, Waste less recipes and tagged 222 million tons, Bells of St. Clemens, lemons, oranges, recipes, Technology Innovation Council, Waste less recipes by Jean-François. Bookmark the permalink. That looks delicious!!! Must try it forthwith! Thanks, Conner. Good to be back, and staying put for a while. So, so glad to have you back ‘on air’ – and in one place :D I look forward to your musings on recycling, food waste recipes and life in general. Congratulations to Bonnie Lee for kicking the local community into gear, too. Thanks, Kellie. Looking forward to catching up with your blog as well. New follower here. Looking forward to future posts! Yum. Love a good chutney. We haven’t made too much Indian food around here in a long while (I was getting my fill in Malaysia), but I’m starting to get a serious hankering for it. So glad to see you back in the blogging sunlight again! And what a great post with which to break our fast of 222 Million Tons (which hopefully is more like 221 Million Tons by now). We’ve been eating local satsuma tangerine oranges and saving the skin for (guess?) candied peels. You might remember those! My kids bug the tar out of me this time of the year to make them when we get a lot of peels. For this weekend, though, it’s been making cranberry jelly. 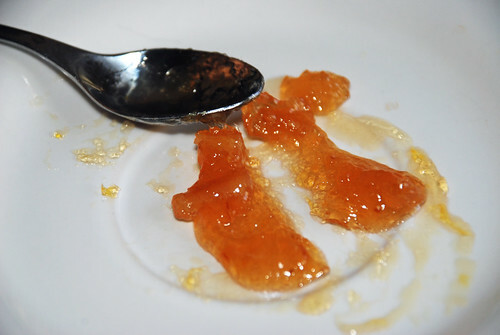 It’s also a fruit pectin recipe (boil for 20 minutes, sieve, add sugar, boil for 2) and is a divine seasonal smell in the kitchen (all spice, cinnamon, clove). We gift these cans every year. 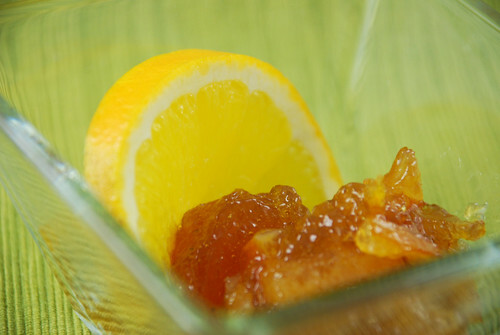 This marmalade is looking like a must-try for the fridge. Again, so nice to have you back and firmly rooted in America. No doubt the time saved in travelling and adjusting to time zone switches (yuck!) is being spent more wisely now! Cheers, Jean-François. Thanks Shannon … sounds like you’re busy now that you’ve been reunited with your kitchen. And, yes, can’t begin to express what a nice change not flying for 20 hours every few weeks is.